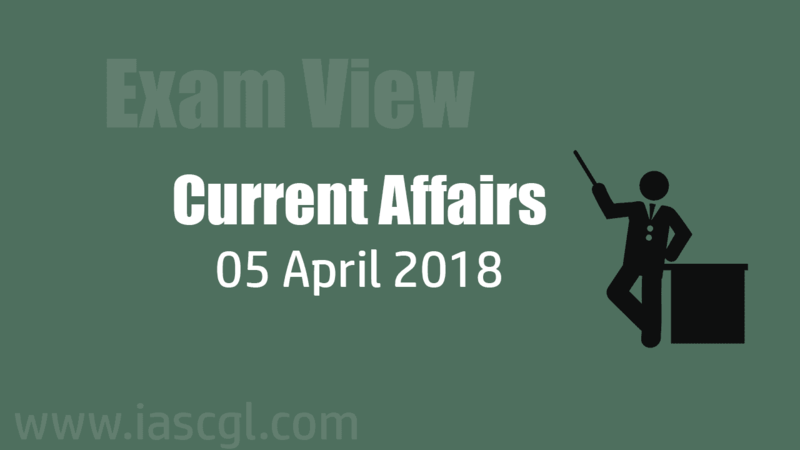 Current Affair of 05 April 2018, Exam View. Telangana Joint Action Committee (TJAC) chairman M. Kodandaram formally announced launching of a new political party. The new party is named Telangana Jana Samithi (TJS). TJAC is a non-political platform comprising political parties, employees associations and other people's organisations that led the Telangana statehood movement. Jio Payments Bank Limited has commenced operations as a payments bank with effect from April 3, 2018. Reliance Industries reportedly plans to move customers of JioMoney to Jio Payments Bank. Malaysia passes law against fake news. Malaysia’s government on Monday pushed a law through Parliament that makes “fake news” punishable with a maximum six-year jail term despite an outcry from critics worried it will be used to stifle dissent before elections. The law targets foreign as well as local media. The law originally proposed a maximum prison sentence of 10 years and fine of 5,00,000 ringgit ($1,30,000) for publishing what authorities deem to be fake news, but the government lowered the jail term to six years following a storm of criticism. India, Japan, and the United States held the 9th Trilateral Meeting at Joint Secretary/Director General/Assistant Secretary level in New Delhi on 4 April 2018 to hold consultations on regional and global issues of mutual interest. And resolved to work towards a “free, open, prosperous, peaceful and inclusive Indo-Pacific region” as well as strengthen maritime security. The talks were held at the “Joint Secretary/Director General/Assistant Secretary level”. This is billed as India’s first live blockchain implementation in the enterprise financial segment. US-based MonetaGo has designed and implemented the production solution. The MonetaGo blockchain solution had gone live on March 23 and so far 1,400 invoices have been processed on it.